Merlu rôti, pomme de terre croustillante et sauce "chimichurri"
Sur les remparts du bourg médiéval du Haut-de-Cagnes, une belle bâtisse du 13ème siècle abrite Le Château Le Cagnard, hôtel et restaurant. 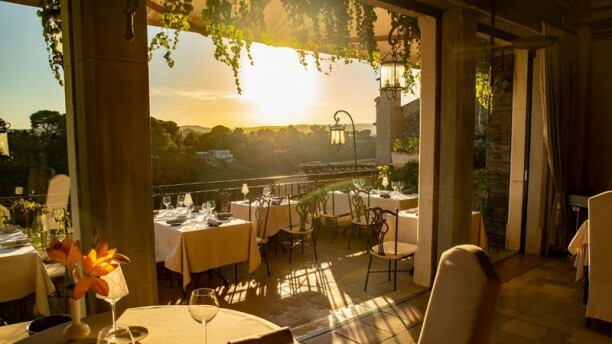 Une salle prestigieuse, un plafond coulissant qui s'ouvre sur le ciel, une terrasse avec vue sur la Méditerranée, une cuisine raffinée et créative, des saveurs provençale... De quoi rêver ! The food was delicious and the setting exceptional, looking out down the hillside towards the sea. The restaurant staff were very attentive ( but not too much) and when they delivered each course they gave us an introduction to the food but with added humour , they were really lovely. This was a special occasion and the restaurant did not let me down. I can see why they have been Michelin rated as the food was divine and beautifully presented and the service impeccable. Luxury setting overlooking bay. Gorgeous food, beautiful flavor combinations. Serving staff friendly, but not at same level as cuisine. Sommelier very affable, but can learn more. Stunning view! Excellent food and service. Very saticfied! We had a wonderful evening! Our server was new and had been with you for about one week. He was very attentive and personable. Thank you. We hope to come again. MercI beaucoup et abientot. Sublime experience at Chateau de Cagnard. The restaurant is elegantly and freshly decorated without losing the medieval ambiance. The level of service, knowledge and attentiveness from the staff was amazing. We ordered the three-course menu which was elevated with a few “amuse-gueules”. Everything we were served was beautifully arranged, perfectly cooked and innovative. The entire experience was characterized by high quality. We are looking forward to our next visit. We stayed in the hotel and so book the restaurant for dinner and had breakfast there too. The atmosphere was good and intimated. Staffs were friendly and warm. Food is average as maybe the master chef was out in low season. Finding this restaurant was like a treasure hunt through the narrow streets of Haut de Cagnes, and it was truly worth the search (it is not so hard to find provided that you get off at the right bus stop). The views are absolutely stunning, as is the restaurant. The service was impeccable, and the food was well presented and delicious! It was a bit expensive, but worth it. I highly recommend this place! Tip: Ask for a table outside, you won't regret it! Also, if you're not staying in Haut de Cagnes, take the free shuttle bus up from Cagnes-sur-Mer. A fantastic restaurant in a great setting.